We are into the trading and exporting of iron ore pebbles. The quality that we offer to customers is completely peerless. 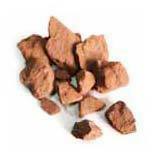 Moreover, natural iron ore pebbles are cent percent genuine, which are extremely coveted among the customers. This unique feature of our iron ore pebbles has made us one of its most sought after suppliers, based in India. A & T Mercantile Exports Co.
We are offering to our valuable client wide range of verity of Iron Ore Pebbles. Our pebble provides an attractive, easy to clean, low maintenance finish to patios, pathways, pool surrounds, steps and balconies. These are provided by us at very reasonable price.